Not that they all agree, oh no. 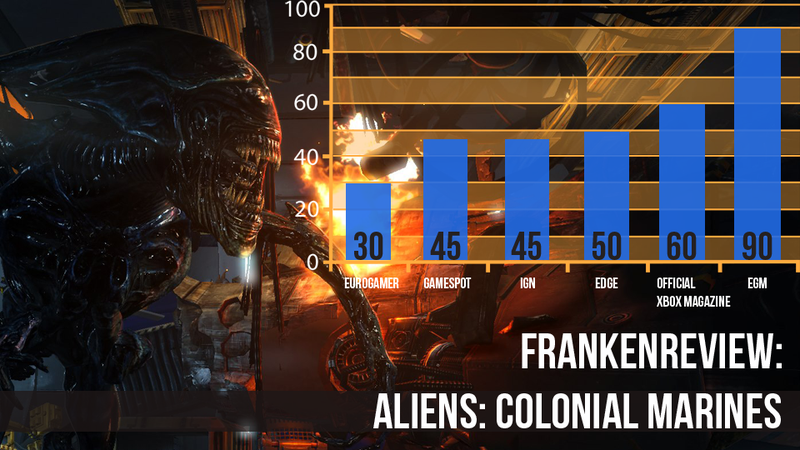 To call Aliens: Colonial Marines divisive would be an understatement. Reactions have ranged from disgust and feelings of betrayal, to indifference, and sometimes even awe and affection. A lot of them think that there's more polish to Colonial Marines' multiplayer than its singleplayer, but how does that affect the overall picture? Here's a sampling of what they have to say. This certainly isn't a game that aims to shake things up. It's as basic as first-person shooting gets, with 11 campaign missions that involve little more than jogging from point A to point B, grabbing ammo, picking up armour and pressing buttons to open doors along the way. There's momentary pleasure in the way the creatures twitch under the sputtering fire of your pulse rifle, but that fleeting throwback to the movie is exhausted before the end of the first level. You may be playing as a Colonial Marine rather than just a space marine, and the monsters might be capital letter Aliens instead of mere aliens, but the framework is not so much set in stone as downright fossilised. The Alien franchise deserves better than this. Aliens: Colonial Marines is a disappointing exercise in bland corridor shooting, dragged down by laughable dialogue and cooperative play that makes the game worse than when you adventure on your own. Colonial Marines is unremarkable in every conceivable way: it's far too easy, generally devoid of tension, and lacking in the variety it so desperately needed. It occasionally lets you peek at the game that could have been, allowing its rare scraps of unsettling atmosphere to seep into your bones. But brief moments of dread and excitement are quickly supplanted by more shrug-worthy shooting and a general aura of "whatever"-ness. The point is that like any decent theme park attraction, Aliens: Colonial Marines presents a fairly convincing facade but its thrills are forced and entirely superficial. You don't ever feel like you're actually in danger. You don't ever feel overwhelmed. In fact, over the course of its six hour campaign the game never gets even remotely close to replicating the genuine feelings of fear and dread that simmer throughout James Cameron's cinematic classic, simply because its xenomorphic enemies are so mindless. These aliens aren't sophisticated human hunters, they're merely acid-fuelled fodder for the seemingly neverending rounds in your pulse rifle. Consequently, Colonial Marines is for the most part a disappointingly mundane, run ‘n' gun first-person shooter that fails to captivate once the initial rush of nostalgia has worn off. At its worst, it's simply feels unfinished—which is a surprise given how long it's been in development. In its central exercise of man versus alien, Colonial Marines feels stiff, shallow and dated. First announced for a 2008 release before the Aliens franchise machine prioritised other projects, it feels like more work has been retained from that initial production period than either Gearbox or Sega would care to admit. The saying that follows fiascos around Hollywood is that nobody sets out to make a bad film; collaborations sour, commercial realities dawn, and sometimes, as seems to be the case with Colonial Marines, time simply passes. While the intentions of all concerned have no doubt been pure—Gearbox in its aim to create a true sequel to Cameron's punchy action hit, and 20th Century Fox in giving the developer a green light to tinker with the central thread of a billion-dollar film series—the final result is a familiar mismanagement of a rich and potent set of ideas and images. They deserve brighter and more sensitive custodianship than this. This is really a review of two games: a derivative story campaign (that you can play solo or with up to three friends in co-op) and a riveting, far superior multiplayer mode that allows you to compete as marines or alien xenomorphs in online matches. Considering Colonial Marines' relatively long gestation period—roughly six years—it seems more attention was paid to fine-tuning multiplayer than to the campaign. You'll visit familiar places, make use of all the equipment you'd expect, see a few old friends, and square off with a whole mess of uglies you might recall from childhood nightmares. I won't spoil too much here in terms of story, but suffice it to say that if you've ever watched an Alien film and gone "That was f***ing rad!" chances are you'll get an opportunity to experience the epicness at some point in the campaign. A game based on existing media has three options. It can strive to be faithful to the original work, privileging authenticity above all else. It can try to do its own thing, using the original work as merely a jumping off point for something else. Or, it can try to find a balance between authenticity and originality. Aliens: Colonial Marines fails spectacularly at all three of these possible approaches.